One of the many facets of this project is testing the member connections of the Memorial Bridge in Portsmouth. The research team is especially interested in this because these new type of connections are relatively untested and we want to see how they hold up over time. The main way that this is tested is by doing strain testing. Traditionally, this is done by using strain gauges, which have to be manually placed on the bridge. This type of strain measurement is the most accurate type of measurements, but it is also the most time consuming, the most expensive, and also could potentially damage protective coatings on the bridge. Because of these drawbacks, the research team has been investigating and employing a new technique of testing. This new type of testing is called Digital Image Correlation (DIC) and uses GoPro cameras to conduct the tests. 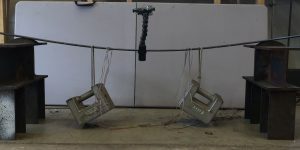 The way this type of testing works is that a GoPro camera is mounted to the member that is being tested, whether it is in the lab or on the bridge, using a “gooseneck” attachment. Then, the camera is used to take a video of the strain tests, usually about one minute. After this, the video is broken down into thousands of frames which can be analyzed by the software. These frames are then put through a piece of software called Vic-2D, which will go frame by frame and measure the distance between pixels from the previous pictures. The software will then translate this to an excel file, where the research team can graph out the strain and figure out what it means for the health of the members. When it comes to Digital Image Correlation, there are numerous advantages as well disadvantages when compared to normal gauge testing. The major advantage is the ease of testing. For DIC testing, the only piece of equipment needed is the GoPro camera, all of the data is stored in the camera, and the rest of the post-processing can be done in the lab. When it comes to using a physical strain gauge, there are many more steps that are necessary. First of all, these gauges require that the protective coating on the bridge must be ground off which can permanently damage the bridge. The GoPro cameras do not require this, they can just be clamped onto the member. Also, for the foil gauges there is quite a bit of wiring involved which must be connected to a Data Acquisition system (DAQ). This DAQ also must be connected to a computer which makes for a lot of equipment on site. This is the biggest advantage of DIC over traditional strain testing, the amount of equipment is much less and there is no damage to the bridge. One of the main disadvantages of DIC is that it can be less accurate than traditional testing, especially if the camera is hit or moved during testing. Digital image correlation software is an innovative new technique that can be used for structural health monitoring without the need for extensive equipment. Research performed by Jake Daniels and Travis Manning. Suitable mathematical representations of the structures are available today for predicting the characteristics of the engineering structures. However, the computer simulations need to be corrected based on the measured data to minimize the discrepancy between the analytical predictions and test results. This correction is known as model updating. Therefore, an objective function is formulated in terms of the discrepancy between numerical and experimental quantities, and an optimization algorithm is employed to minimize the objective function. Tracking structural integrity and estimating the damage nature in a structure is referred to as health monitoring. Finite element model updating can be a way of structural damage identification. If the model is updated so that it represents the healthy condition of the structure, it could be used as a base model for future condition assessment and damage detection. For this purpose, the data corresponding to the damaged condition of the structure is considered for the updating process. When the updating is done, the new estimated parameters indicate the damage in the structure. 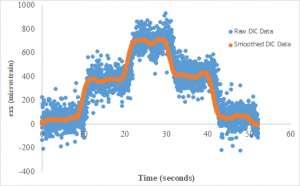 For the model updating and health monitoring of the Memorial Bridge, a MATLAB-based model updating software developed at the University of New Hampshire is used. 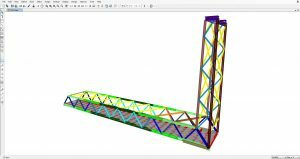 The software, called MUSTANG (Model Updating STructural ANalysis proGram), is linked to SAP2000 using its application programming interface (API) to perform parameter estimation for the bridge. 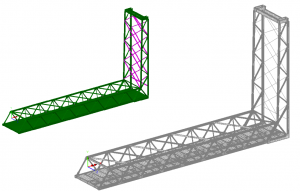 Analysis of the structural behavior and load carrying capacity of the Memorial Bridge is one of the most interesting parts of the “Living Bridge” project. The south span and tower of the bridge have been instrumented with various types of sensors to provide raw data for remote monitoring of the bridge. The post-processing of data obtained from long-term monitoring of the bridge not only allows to track the impacts of ambient changes on the bridge global parameters, it also yields conclusive information for making decisions about the bridge actual condition. Since the Memorial Bridge was newly reconstructed, the measurements, in the early age of the structure, can be used to train a valuable benchmark for future condition assessments. 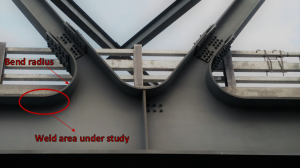 This benchmark will determine whether potential changes in the structural responses are due to damage in the bridge components or change in performance. 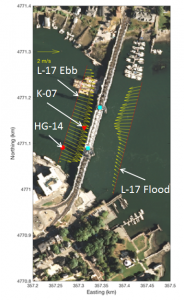 An integrated decision-making algorithm inspired by the statistical pattern recognition techniques combined with engineering standards has been developed to inform the bridge owners on inspection planning and operational decision-making. 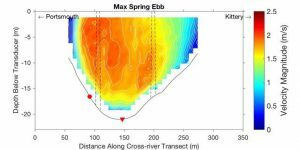 To provide a clearer perspective of the bridge performance, a calibrated analytical model of the bridge is developed as a basis for simulating physical damage due to accidental events and damaged-induced changes in the bridge dynamic properties (Milad Mehrkash). The results of this study could be beneficial to bridge owners for proactive condition assessment of the bridge, reducing long-term maintenance costs, avoiding excessive repair or replacement costs of deteriorated parts, and sustainable development of smart bridges.